Riverside, CA 4/27/16 – RJ Anderson headed into rounds 3 & 4 of the Lucas Oil Off-Road Racing Series at Lake Elsinore, CA this past weekend tested and ready to compete. The RJ37 team entered the weekend prepared for anything with a goal of finishing on the podium in both rounds. Despite the usual race weekend challenges, the team met their goal taking home a 2nd & 3rd place finish, making a statement that RJ has the speed, the truck and the team to make a run for the 2016 Pro 2 championship. “We came into Lake Elsinore as prepared as we could be. The team and I tested at the track numerous times leading up to the weekend so I was confident in the truck set up. As a driver, when you don’t have to worry about the truck and you can focus entirely on driving, it makes racing fun and it allows me to really push myself with confidence. We found the box both days which was huge as this year is really about winning a championship. Its not going to be easy, but I know what it takes and reaching the podium consistently is something you have to do.” stated RJ37 driver and team owner, RJ Anderson. This weekend marked the 101st and 102nd time RJ has reached the podium as a professional in his off-road racing career. His 100th podium came 2 weeks ago behind the wheel of his Polaris RZR XP Turbo at the WORCS racing series round in Hurricane, UT. To have reached the podium this many times at only 23 years of age, the future looks to not only be bright but also full of entries into the off-road racing record books. “Anytime you race in your backyard you feel the pressure to perform for all of your friends and family who come out to support you. With this weekend being the Rockstar Energy SoCal Shootout I knew that my friends and family would be joined by everyone from Rockstar Energy. Being new to the team I wanted to prove to them that they made a good investment in the RJ37 program. To earn those podiums, and to do it in front of everyone who supports me made this weekend that much sweeter. I look forward to carrying this momentum into Utah next month” stated RJ37 driver and team owner, RJ Anderson. 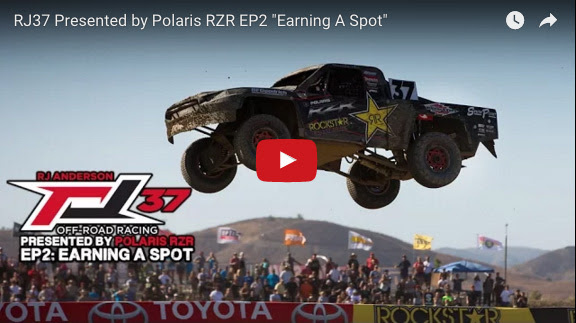 RJ, alongside title sponsor Polaris RZR, is proud to release the second episode in the RJ37 Presented By Polaris RZR video series. For the past two years, Mad Media & UTVUnderground.com have documented RJ’s racing career and have recently began to release episodes that bring RJ’s first two seasons as a Pro 2 racer to life. Episode one titled “Roots” was released a couple of weeks back and for those who missed it you can watch it by CLICKING HERE. Episode two which is titled “Earning A Spot” takes you through two of RJ’s biggest moments as a Pro 2 racer, first his podium finish in the 2014 Crandon Cup race and his first Pro 2 win at last seasons Lucas Oil Estero Beach round. The title explains that while RJ has certainly proven himself as a worthy competitor in off-road racing, as a 23 year old competing at the highest level he still must earn his spot amongst the best in the sport. Stay tuned as we continue to release more episodes over the coming weeks and months! RJ wants to invite everyone to come see him compete next month at the Lucas Oil Off-Road Racing Series rounds 5 & 6 at the Utah Motorsports Complex in Tooele, UT. The RJ37 team with support from Polaris RZR will unveil a new season long program where one winner will be selected at the end of the year to win a FREE 2016 Polaris RZR 170! It will be free to enter but you can only do it in person at the RJ37 pit at Lucas Oil Off-Road races this season. More details to come!